How to free download Windows 10 mobile and update to Windows 10 mobile operating system to experience the new mobile OS features? Wonder whether your Lumia phone can get the new Windows 10 mobile and how to get Windows 10 mobile download and upgrade to Windows 10 mobile OS? Continue to find out. 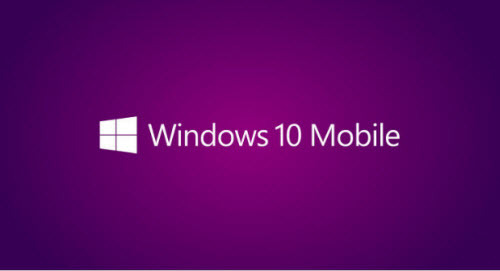 Windows 10 Mobile is the latest mobile operating system developed by Microsoft. It is a successor to Windows Phone 8.1. 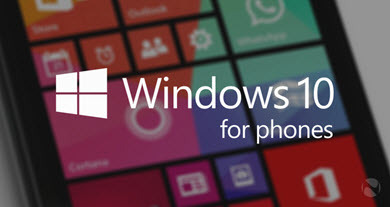 Windows Phone 8.1 smartphones can be upgraded to Windows 10 Mobile yet also depending on the hardware compatibility, manufacturer support, and carrier support. Not all phones will receive the update or support all of its features. The first Lumia phones powered by Windows 10 mobile system are the brand-new Lumia 550, Lumia 950/XL which are scheduled to be released in November 2015, and other existed eligible Windows phone devices can receive updates to Windows 10 mobile in December 2015. Convert any SD/HD/4K/8K videos movies to Windows 10 mobile supported video formats like MP4, AVI, WMV for playback various videos on the Windows 10 mobile phones with ease. Supported devices for Windows 10 mobile: Only these Lumias are eligible for today's Windows 10 mobile release. New Lumia 550, 950/XL, and Lumia 630/635/636/638/730/830. System: Windows Phone 8 and 8.1 phones can update to Windows 10 mobile for free. The Windows Insider program allows users to bypass the carriers and install the new Windows 10 mobile operating system on their phones directly. Storage: At least 8 GB of internal storage. RAM: 512 MB and only support for 32-bit. The minimum amount of RAM required is decided by the screen's resolution: screens with a resolution higher than 960×540 require 1 GB of RAM, screens of 1440×900 and higher require 2 GB, 2048×1152 and higher require 3 GB, and 2560×2048 and higher require 4 GB. Screen resolution: With a minimum screen resolution of 800x480. Note: 1. The Windows 10 mobile download and update may need quite some time and might need to restart more than once to finish the Insider Preview installation and get the complete Windows 10 mobile update. 2. If you have installed the Insider Preview and then want to return to Windows Phone 8.1, you have to use the Windows Device Recovery Tool. It's the only way to remove Insider Preview — only uninstalling the Windows Insider app will not restore your phone to the previous Windows Phone version. So we strongly advise you to backup all your useful and important data before downloading and upgrading to Windows 10 mobile and remember to fully charge your phone battery, really. Step 1: To download and install Windows 10 mobile on your mobile devices, you'll first need to check whether your device is against the list of compatible devices. Step 2: Make sure your device is running on Windows Phone 8.1 and sign up for the Windows Insider Program on this site if you haven't already. Step 3: Go to the Windows Phone Store to download and install the Windows Insider app. Step 4: Launch the Windows Insider app and sign in with your Microsoft Account. Step 5: Click 'Get preview builds' and choose Insider Fast or Slow. Select Fast to update as soon as it's available or choose Insider Slow if you want to wait until builds are more stable before update. Step 6: Read the responsibility warnings and tap 'Accept'. Step 7: Go to Settings, locate 'Phone Update' and click 'Check for Updates'. Step 8: Begin to download the latest Windows 10 builds for your phone. Follow the instruction to install and upgrade to Windows 10 mobile OS. Once the Windows 10 mobile OS finishes downloading, you can start exploring all the new features of the Windows 10 for phone. 1. A major aspect of Windows 10 Mobile focuses on 'One Platform' scheme of harmonizing user experiences and functionality between different kinds of devices, particularly between Windows 10 PC and smartphones. 2. Provide you a seamless, cross-platform experience. Notifications can be synced between devices, for example, you delete a notification on a laptop, and it will be also dismissed from a phone. 3. All Windows 10 apps like Outlook Mail, Outlook Calendar, Maps, Facebook, Cortana, Skype and so on can runs well on Windows 10 mobile. 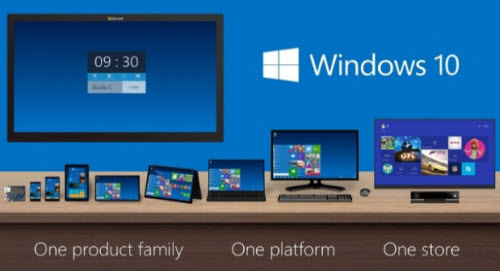 A new Office Mobile suite, Office for Windows 10, will also be included with the Windows 10 mobile operating system. 4. The start screen now can display wallpapers as a background of the screen behind translucent tiles, rather than within the tiles. 5. A new Photo app aggregates content from local storage and OneDrive and can automatically perform enhancements for photos. • Rip/convert any self-made or commercial DVDs to MP4, AVI, WMV, etc, for playback on Windows 10 mobile phones with highest image quality at a pretty fast speed. • Rip DVDs to Windows Phone (10/8.1/8), Lumia 550/950/XL, iPhone, iPad, Android, Surface Pro, Xbox, PS3/4 etc, for watching DVD movies on mobile devices. • Backup DVD to ISO image, VIDEO_TS folder or copy DVD full/main title to a single MPEG2 file for convenient storage.